Wayne was one of my insurance clients when he was laid off from his factory job. The father of two young children, he was bright and personable, so I suggested he give insurance sales a try. He liked the idea, so he earned a license and began his career as one of my employees. After about a year he opened his own agency a few miles away. Once in a while, he’d get in a crunch and borrow small amounts of money for a few days. Every time, he gave me a check for the amount he borrowed and dated it for the day I could cash it. Usually it was about a hundred dollars, and I always got it back within a few days. Always. One Friday afternoon he came in and told me he needed $500 until the following Monday — just three days. Times were tight, and although I had the money, I knew I’d need it early in the week. Still, I trusted him and we exchanged checks. On Monday I deposited his check. On Wednesday it bounced. I called his office and got no answer. Wayne had been arrested for buying $500 in marijuana a few hours after I gave him the money. When I finally reached him, desperately needing my money back, he told me he bought the marijuana for a friend with cancer, but had been charged with dealing. The police had my money, and Wayne was sure he would go to jail. He said he’d “try” to return my money as soon as he could. Then I lost track of him. His phones were disconnected, his office was closed, and I heard he’d been sent to jail for six months. That $500 loss really hurt, but I survived. Five years later, I was sitting in my office writing checks. The money ran out before the bills did, and I was feeling hopeless. I was a single mom, raising four children, and it was tough. Just then, Wayne walked in and handed me five hundred-dollar bills. Wayne lived more than 1,000 miles away and five years had passed. But there was my money again, when I really needed it. And there was Wayne, proving that some people really do the right thing. 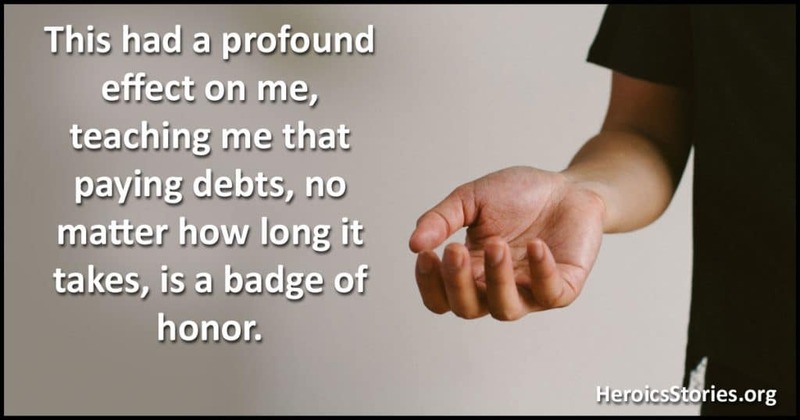 This had a profound effect on me, teaching me that paying debts, no matter how long it takes, is a badge of honor. Awesome story. It made me wonder if there was a great plan that knew when you would most need the money. Thanks for sharing and helping us to reflect on what happens in our lives. Something similar happened to me a couple of years ago. A friend I had known for more than 30 years repaid a loan I had given him early in our friendship. I had forgotten about it over the years when he said he had something to give me, and handed me an envelope. Inside were ten $100 bills–the amount of the loan with 30 years interest, he had figured. “I didn’t have the money to pay you back then, but I do now.” I was speechless. Until then, I did not have any emergency cash at all. All I had to give him were thanks and hugs. And we are still friends. Many years ago, as my wife’s father was dying of cancer, he sold his small business to another small businessman on an installment basis over a five year period to provide for his wife after he died. When the buyer was bankrupted by a lawsuit a couple of years later we learned it was an unsecured loan so my mother-in-law received nothing in the bankruptcy. About 6 years later he showed up to pay the rest of the debt, even though it had been discharged in his bankruptcy. Although my mother-in-law had passed in the interim he insisted on paying the estate because he had failed a friend — and that mattered more to him than what the bankruptcy court had said. Wow a powerful message, thank you so much for sharing. I am sure that many people can see themselves in your story as either the ones that loaned or the ones that borrowed.